Since the 4.2.3 update my D5 is refusing to go into an area of my flat that it used to deal with just fine. The area is totally unobstructed. I've tried relocating the base station and updated with the latest firmware which allows for floor plans, but it hasn't made any difference. It also sometimes swerves other totally clear areas that a few days previously had things like a clothes dryer in them, as if those objects are still there. If I start the robot in the area it normally avoids, then it cleans just fine, but when it approaches the area on its normal cleaning route it totally freaks out at the brink of the area and tries to escape. It's like its encountering a virtual wall, but there isn't one. I even started wondering if there were pipes under the floor that had become magnetised and were acting as barriers. Neato downloaded my log files ages ago but no solution has been forthcoming from them. I'm convinced the robot is hanging on to some sort of previous memory of the areas, even though the D5 never had a floor plan option, as such. I've repeatedly asked Neato how to factory reset the robot to try and clear down the memory, but they literally just ignore that question and talk about other things. So is it possible to totally reset a D5? I don't mean the usual soft / hard reboot. I mean wipe its memory completely so I can start from scratch. I have a hunch that will fix the problem but I can't find a way of doing it. Since you already have 4.3.0 update, have you actually set the robot to do a special floor plan run? Or have you just used normal cleaning button? I suspect 4.2.3 update had some preparations for the next no-go lines update, but we cant know for sure. Floor plan mapping run should do a fresh map, without memorizing previous runs. yes, i got the update and it asked me to run a special floor mapping cycle for the first time, which I did and it still avoided the problem area as it had previously been doing, even though the area was empty and clear. This was the report it delivered after the mapping run. 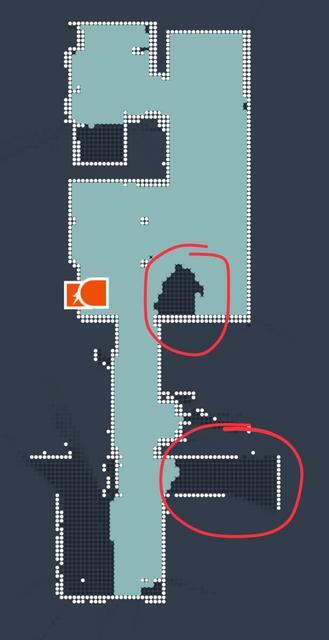 The area circled bottom-right is the area it always avoids. The area circled in the centre was totally clear, although some days previously there were some clothes hanging on a drier there which would have obstructed it. When this run was conducted that area was totally empty and clear. What type of flooring do you have in those rooms? bcarpenter wrote: What type of flooring do you have in those rooms? the top one has ceramic tiles, the lower one is sealed wood. my D7 did all the areas without a problem, as did this D5 before the update. Have you tried ro run robot from its own switch? I noticed that my D5 actually avoids one particular corner of my house on floor plan run. I tested the robot with starting the cleaning run from its own switch and it cleans the corner every time. This is strange. I will try to refresh the floor plan run as some parts of the house have been changed slightly. well i do have an update on this as it happens. I picked up a new D7 from amazon on black friday. I took the D5 out and put the D7 with its dock in the same spot. On it's very first run it mapped the entire floor but avoided the exact same spot!! So i now know it's not some weird memory retention etc in the D5, it must be something physical in my house that's causing it. The area it refuses to enter has a few chrome fittings which i thought maybe were confusing the lasers (even though they never have in the past) so i covered them all up. I also thought maybe the metal strip across the threshold of the room might be causing a problem, so masking taped that off as well, but none of this made any difference. I'm honestly starting to think it must be a pipe under that part of the floor that's somehow become magnestised and is acting as a virtual barrier. That's probably the stupidest thought I've ever had, but i'm really out of ideas here. You should take some panoramic views of the area being avoided, from a point of view low to the ground, so we can see what the Neato is seeing. We might have some feedback after seeing that. Hook the robot to laptop, open neatocontrol, put the robot in a test mode and push robot on that problem area. In a same time see what magnetic sensors report to neatocontrol. There was a case once where something on the floor or ceiling below, maybe a ceiling fan, was triggering the mag strip sensors, and they had to be disabled. Or maybe RF shielding, ferrites, I forget. JEfromCanada wrote: You should take some panoramic views of the area being avoided, from a point of view low to the ground, so we can see what the Neato is seeing. We might have some feedback after seeing that. HiTec wrote: Hook the robot to laptop, open neatocontrol, put the robot in a test mode and push robot on that problem area. In a same time see what magnetic sensors report to neatocontrol. looks like there's no mac version, unfortunately. no pc here. glnc222 wrote: There was a case once where something on the floor or ceiling below, maybe a ceiling fan, was triggering the mag strip sensors, and they had to be disabled. Or maybe RF shielding, ferrites, I forget. it feels like that. it stated happening after the 4.2.3 update, but racking my memory tells me it was around the same time the temperature dropped here and i started using the heating. Some of the pipes run right under that spot and maybe somehow that's affecting the robots.. somehow? Neato Control employs text commands which can be given using any terminal emulator, teraterm etc., over USB, to read sensors etc. The command language is documented here top of forum. If the manual is no longer at the Neato Robotics website, leave a Private Msg with an email to send it. HiTec wrote: Have you tried ro run robot from its own switch? Ah interesting. I tried a manual start from the button and it cleaned everywhere just fine. Nothing missed at all. So what could be causing the floor plan to have an issue that manual cleaning doesn’t? I had an obstacle (cat tree) that limited the space for robot to go to that corner. It certainly had space to go there, but on mapping run it just didnt go there for some reason. After map run, i made some more space for it to go there, but robot acts like there was a virtual wall, or magnetic barrier there and avoids that corner. So there is definitely room for improvement in this new feature. I havent done a new mapping run yet, but i suspect that it should fix that problem. If the button run cleans the area there is no magnetic or other interference. The mapping operation is at fault for whatever reason, software defects or other factors. One aspect of the software is a limited size of the memory to store the map. Starting the robot close to the area might alter results in this possible case. The mapping models may have more memory than the older models just for this application. Hard to say whether the memory chips might be damaged. We would have to see the proprietary software to know much about this. Shops would just replace the system board to see if that helps. If there was a software update, it seems this is often the time when some new bug is introduced (fix one thing and break something else). One of those shut down an entire airport system all day just from doing an upgrade. Perils of the computer era. right, so, the brand new D7 experienced the same problem as the D5 - avoiding one particular area. Then I did what HiTec suggested and started a cycle using the hard button, and the D7 cleaned the area no problem. Then last night I started a cycle from the app, which will have used the floor plan, and the D7 cleaned everywhere without a problem! Almost as if the hard-start gave it a kick somehow. So now I'm totally confused. I'll try starting a remote clean from work today and see what it reports back. It is almost as though there is a programmed "no-go line", virtual boundary, stuck in memory; perhaps clearing memory fully by disconnecting the battery a minute would do something, except you are getting it on two different vacuums, suggesting something in the software -- though what sort of bug would operate just at this location is not clear. One thing some of that kind of software does is try to identify rooms by fitting simple patterns to the areas, and maybe that excludes some nooks here and there, but what exactly is in Neato's software is not public. One thing to consider is whether the lidar "sees" the area, which could be more relevant in mapping than in simple cleaning, as the robot will go places it might not even see, while mapping could require it (the lidar has a limited range about 15ft or 5m, affecting use in large spaces, and cannot see reflective surfaces or very dark colors -- treated as spaces too large and to be explored, where no robot has gone before...) Placing the robot in that space and observing the lidar scan over USB might show something, though not very likely. Yet there must be something the mapping run does differently -- I did not get clear whether the mapping run cleans the area and just does not record it, or whether it does not enter the area. In the latter case, there must be some sensor data to which it is responding, even though the button run ignores it.